Jessie Carty’s writing has appeared in publications such as MARGIE, decomP, and Connotation Press. She is the author of five poetry collections which include the chapbook An Amateur Marriage (Finishing Line, 2012), which was a finalist for the 2011 Robert Watson Prize, and the award winning full-length poetry collection, Paper House (Folded Word 2010). Jessie is a freelance writer, editor, and teacher. She is the founding editor of Referential Magazine. She can be found online here. How are you celebrating National Poetry Month? I’m participating in the Poetry Book Giveaway. I’m teaching an online workshop called Poetry Isn’t Just for Poets. I’m volunteering to speak for at least three different teachers during April although I’m still open for others who might want a poet to visit their classes (any grade level. I’m going to a high school and a community college for sure!). But, mostly I want to spend time with poetry. I picked up a lot of new poetry books at AWP, and I plan to spend a lot of time with them. I’m actually working on several more academic essays on teaching composition and how that ties with being a creative writer. On the poetry side I’m trying out a new method for myself. I work in my journal starting each Thursday, and I keep working on that same material all week until I type it up on Wednesday. Sometimes a poem emerges, others not so much. I have books coming out later this year (What if We Could Morph, Sibling Rivalry Press) and one in early 2014 (Practicing Disaster, Aldrich Press) so I’m in that post book regrouping to see what I want to say next. A lot of the newer poems seem to have formal underpinnings: sestinas and bops. Tell us about Referential Magazine. What have you learned in the process of editing and producing a web journal? Referential is actually my second web journal project. I wish I’d worked on a magazine earlier in my writing life. Working the other side of the desk I think can make you much more compassionate for editors in general, and gives you a new insight into what is going on in the contemporary writing world: the good and the bad. What’s the best writing advice you’ve ever received? Best advice you’ve ever given? Hmm. This is a tough one. Probably one of the best pieces of advice I ever received was to “bone-up.” This was actually written on a paper I wrote for Fred Chappell in a Modern Poetry Literature course I took as an undergrad. Fred was chastising me because I mixed up some literary terms. Since then I have tried to learn as much as I can about the history of whatever it is I am working on. That being said, I still have to look up the difference between allegory and symbolism. The best advice I can give ties in with what Fred said to me: Join the Conversation. By this I mean, know your history. If you start writing, acting, voting, whatever you choose to do can only be improved by knowing what came before you. Why do you want to write? Probably because you read something you love, and you want to be part of that conversation. So, do it. Share your story, and know the other stories around you. 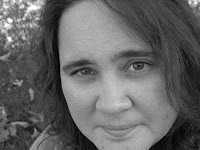 Kaitlin Keller will receive her MFA in Creative Writing from Wilkes University in June 2013. Her latest literary venture involves raising awareness of the “novel in verse”—a hybrid genre which blends elements of poetry and verse with the formulaic structure of fiction novels. She is also currently penning the sequel to her first manuscript, Siren. She is a fanatical music lover and karaoke singer. Never dwelling long enough to call one place home, she currently resides in Manlius, New York with her husband and her constant companion, Fizzgig, her faithful Shih Tzu. Lori A. May is the Founding Editor of Poets’ Quarterly.